In 1991, when I was a student at the SAIC, the Art Institute hosted a retrospective exhibition of Martin Puryear's sculptures. Most of the pieces on display were made of wood and somehow familiar and mysterious at the same time. Some resembled boats, others were like human figures; but the works would turn away and in on themselves, refusing to be defined. Now, 25 years later, there's "Martin Puryear: Multiple Dimensions," a survey of the artist's prints and drawings at the Art Institute. The earliest work here comes from his time serving in the Peace Corps in Sierra Leone in the mid-60s. There are drawings of thatched huts, camels, and plant life, plus some portraits. Though they're fairly conventional, these pieces already show an attention to the structure and contour of forms that would become a hallmark of his later style. Wood-block prints of animals look like silhouettes, yet manage to retain both gravity and weight. 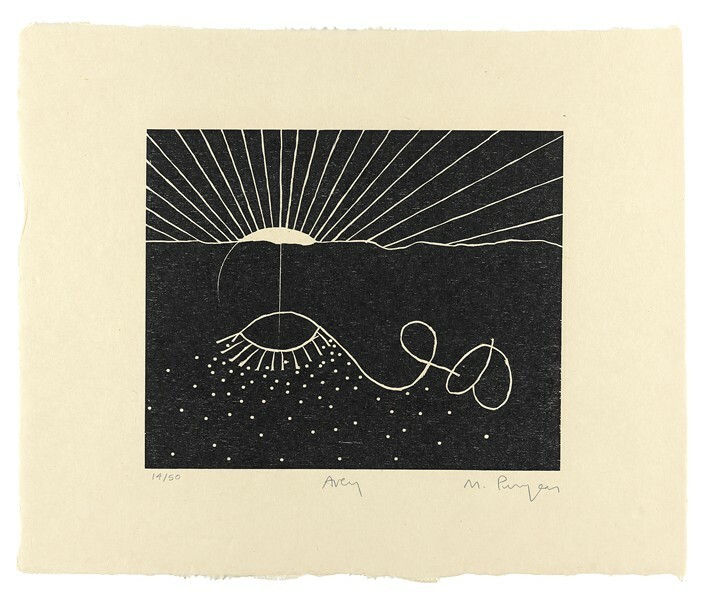 Improbably, Puryear is able to keep these simple images from appearing trite. The lion's share of the drawings are preparatory studies for sculpture. Here one sees how Puryear methodically works out the scale, size, and proportions of every object before ever touching a single piece of wood or metal. On some large sheets there are a dozen variations of the same shape, seen from many angles; as with the best sketches, it's like a direct look inside an artist's head just as he's turning an idea into an object. But there are stand-alone drawings as well—many produced with rich charcoal or Conté crayon—wherein black, indeterminate shapes look more like deep holes or chasms than solid forms. 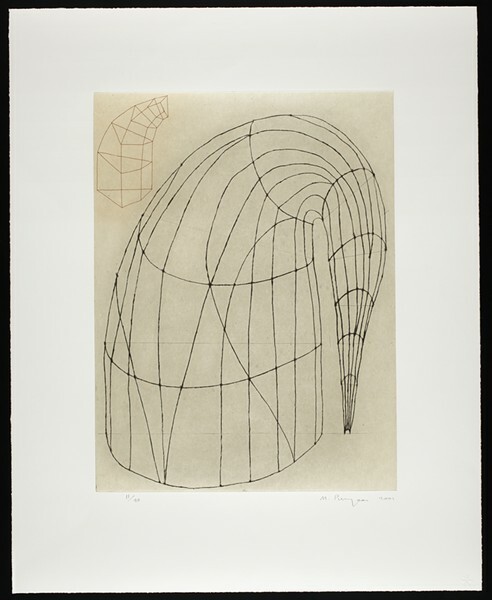 Most of the prints are different takes on three-dimensional forms that Puryear has created elsewhere. A similar structure to Untitled (2001) (seen above) is repeated in several of his wooden sculptures. Is it an anteater bending down to scope out the ground? A plant seen under an X-ray? Not knowing for sure doesn't make the drawing any less captivating. In order to put the two-dimensional work into proper context, maquettes, models, and smaller versions of sculptures are also included in the show. Puryear studied with a master cabinetmaker in Sweden, so meticulous craftsmanship is evident throughout. Like the best furniture, its assemblage is a mystery, but its solidity is indisputable. When Puryear was invited to illustrate a new edition of Jean Toomer's 1923 Harlem Renaissance novel Cane he set himself the challenge of working solely on a flat surface. The wall text that accompanies the Cane woodcuts mentions that Puryear thought these pieces were unlike the rest of his output. In this series he is still walking a fine line between abstraction and figuration, but there are also hints of landscape or environment rather than the voids or simple horizon lines visible in much of the rest of the show. Whatever the medium, Puryear's careful, elemental images are thought-provoking. Contrary to so much artwork of the last 50 years, there's no bombast—instead, there's longing for a timeless grace. Though many of Puryear's pieces are untitled and elusive, they retain meaning, quiet but hardly empty. Martin Puryear's work with wood erases the line between craft and art.